"You were my first child, I was so glad you were born." John Washington was born blind and with a severe loss of hearing that has become more extreme over time. Just before he turned 30, he met his future wife, Fannie Ruth, who was also blind and deaf. In 1950 they got married, and remained together for 55 years having three children together—Melva, Warren, and Canady—before Fannie Ruth passed away in 2005. 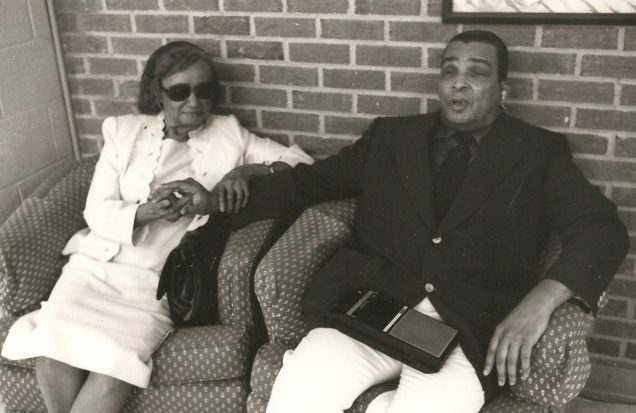 Now 95 years old, John recently recorded a StoryCorps interview with his eldest child, Melva Washington Toomer (pictured in the player above), using a TeleBraille machine, a device that requires Melva to type her questions on a keyboard which are then translated to a braille touchpad for her father to read. Originally aired August 19, 2016, on NPR’s Morning Edition. Above: John and Fannie Ruth Washington at the Durham, North Carolina, YMCA in the mid-1970s where were he worked as a massage therapist. Photo courtesy of Melva Washington Toomer. JW: You were my first child, I was so glad you were born. I cannot express the way I feel when I held your sweet little body. I kissed you, I loved you. Oh Melva, I was so proud when I started taking you out with me. You’d take me by the hand, and lead me where you wanted to go. MWT: (Typing) Do you have any favorite stories about raising us? JW: Do you… raising us? (Laughs) One night I did catch you trying to sneak out. MWT: (Laughs) We knew our parents couldn’t see, and we used to slip out at night, so Daddy started sleeping in front of the door. MWT: (Typing) What were some of your proudest moments? JW: What are my proudest moments? Well, I did not graduate from high school. So I began to read books in braille to learn the ways of life. And then I taught people to read braille. So if I could help some person, then my living will not be in vain. MWT: (Typing) Do you have any questions for me? JW: Do you have questions…? JW: Yes, I’m 95, and I might live to be 100, what are you going to do with me? MWT: I am going to take care of you the best I can. JW: You’re doing a wonderful job. God bless you. MWT: Daddy, I thank you for the interview. JW: Oh, you’re welcome. Thank you Melva.